The Shetland Sheepdog: Is this the Right Breed For You? Shetland sheepdog owners will tell you that their favorite breed is intelligence, loyalty and affectionate and they are absolutely right. It would seem that this breed has perfected a double personality—one that they show with their owners and one that they reserve for unknown persons. Does it take long to win them over? Most dog lovers would tell you absolutely not. Once the sheltie feels you are a person he can trust, then you are showered with love and playfulness. It is true that some are shy, but not all. What they all have in common is a fierce loyalty, an intelligence that surpasses many of the small breed dogs, and an energy level that will keep you in shape. What’s not to love? Sheltie lovers will tell you emphatically Nothing! But Shelties may not be for everyone. For starters, they have a thick double coat that requires a lot of grooming. They also shed—the seasonal variety, once in the spring and once in the fall, but any kind of shedding may be hard for those with allergies. Finally, they are not the quietest of breeds. Nuisance barking is not their style, but they do alert you when they sense danger, or even when a friendly stranger knocks on your door. 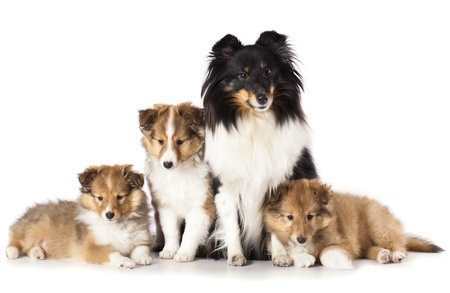 Many people think of the Shetland sheepdog as a miniature rough coated collie and assume the breed was dwarfed down from the larger “Lassie” type dog, but this not true at all. The origins of the modern breed dates back several hundred years to a small island north of Scotland, the Shetland Islands. These little islands in the North Atlantic are rocky with little vegetation. Animals that originate here are smaller than usual such as the Shetland Pony. The shetland sheepdog is no exception. While still debated, the origin of the breed was likely a northern Spitz type dog brought to the islands from a Scandinavian country. Throw into the mix, a King Charles Spaniel, a Pomeranian, and a Scotch Collie and years of breeding and you have the modern day Sheltie. Bred mainly to assist the crofters (or farmers) herd sheep, they were also welcomed as companions and served as guard dogs to the small farms. Farmers were poor and the resources limited. By the 1800s, farmers began realizing that they could sell their little dogs to wealthy travelers looking for cute companions. Their original working dogs became smaller and smaller as they added Pomeranian and even Corgis into the mix. By the turn of the century, farmers determined that their working dogs were too little, so they began adding collies into their breeding programs, producing larger dogs. They were first registered with the Scottish Shetland Sheepdog Club in 1909 and then recognized by the Kennel Club in 1909. They were first recorded as a Shetland Collie and then the name was changed to the Shetland Sheepdog. The first Shelties arrived in the US in 1908 but was not recognized as a breed by the American Kennel Club until April of 1911. In 2013, the Shetland Sheepdog ranked 21st in popularity with the American Kennel Club out of 177 breeds. The Shetland Sheepdog is intensely loyal, affectionate, and responsive to his owner. However, he may be reserved toward strangers but not to the point of showing fear or cringing in the ring. Originally developed to assist farmers with herding sheep, they still retain their herding and chasing habits, so it’s not conceivable that your little Sheltie will try to herd your toddler. They are very athletic and enjoy running and chasing, and because they have a high energy level, a good chase once in awhile is necessary to keep them happy. They aren’t marathon runners, though and prefer to use that energy in short bouts of rough and tumble play. Shelties are very affectionate with their owners and crave attention. They are quite happy to rest happily in the same room but do very poorly if left for extended periods of time outdoors or isolated from the favorite person. Many are prone to separation anxiety. Many Shelties have a shy side which often has a genetic component. Shy dogs often become fearful of strangers and they will bark more than their confident counterparts. Shy Shelties also have a tendency to run from the situation, which can be dangerous if outdoors unleashed. Some even have a fear of being touched. Early socialization will help shy dogs gain confidence. Their intelligence makes these dogs a breeze to train, but a positive, gentle approach is necessary because they are a very sensitive breed that does not respond to harsh, loud methods. Some even shut down emotionally and physically if owners scream at them. 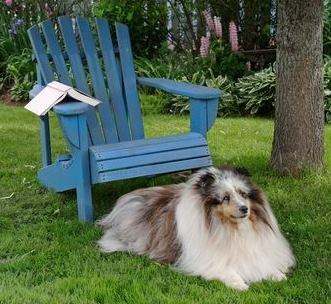 Shelties are versatile and have served as medical alert dogs, therapy dogs, and assistance dogs. 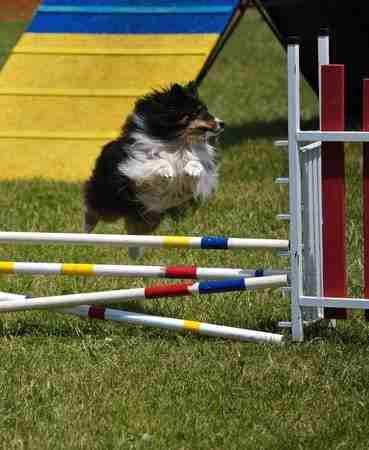 They excel in agility, rally, herding, flyball, tracking, obedience as well as conformation. 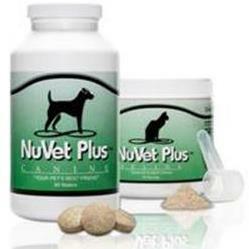 They are at their best as a companion and beloved pet. This breed has a thick double coat consisting of a long straight, water-repellent top coat and a short dense undercoat. Mats can form quickly if not brushed and usually develop behind the ears, on the front and hind legs. They shed twice a year, in the spring and fall, but they lose hair throughout the year. Shaving is not recommended because they may not regrow the hair, a condition called alopecia. Their long coat is waterproof and so mud and dirt can often be removed by brushing. Bathing should be done when the coat is dirty or smelling nasty. Usually, you can get away with bathing about once every one or two months. A daily brushing is advised with a good pin brush or bristle brush. An undercoat rake is an excellent addition to your grooming kit and should be used to remove any dead hair in the undercoat, especially when the dog is shedding. Groomers recommend that brushing be done by parting the hair and brushing one section at a time, called line brushing. Hair continues to grow on the Shelties's ears and should be trimmed when it gets longer than the ear leathers. Owners learn to do this themselves or have a professional groomer do it for them. Nails will need to be trimmed and teeth brushed. Like other small breed dogs, Shelties can have other problems that are less severe and are not life threatening. Eye problems such as cataracts, corneal dystrophy, and eyelash abnormalities, and progressive retinal atrophy have also been seen in the breed. Hip Dysplasia and other orthopedic problems such as Legg-Calve-Perthes disease and Patellar and Elbow Luxation occasionally occur. Skin problems are common in Shelties. Those with allergies suffer from itchy skin and bacterial skin infections. It is also worth noting that Shetland Sheepdogs and other collie-like dogs react adversely to some drugs. Not all Shelties have problems, but if they have a mutant gene called mdr 1 they cannot take ivermectin (the drug used in heartworm preventatives) Imodium A-D, Flagyl, and some anesthetics. A DNA test is available to determine whether your dog is affected. Without the test, it is best to avoid these medications. 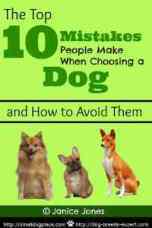 Stanley Coren, neuropsychologist, British Columbia professor, and author of The Intelligence of Dogs: A Guide to the Thoughts, Emotions, and Inner Lives of Our Canine Companions assessed and ranked 110 breed based on training ability. The Shethland Sheepdog was ranked #6 in intelligence.